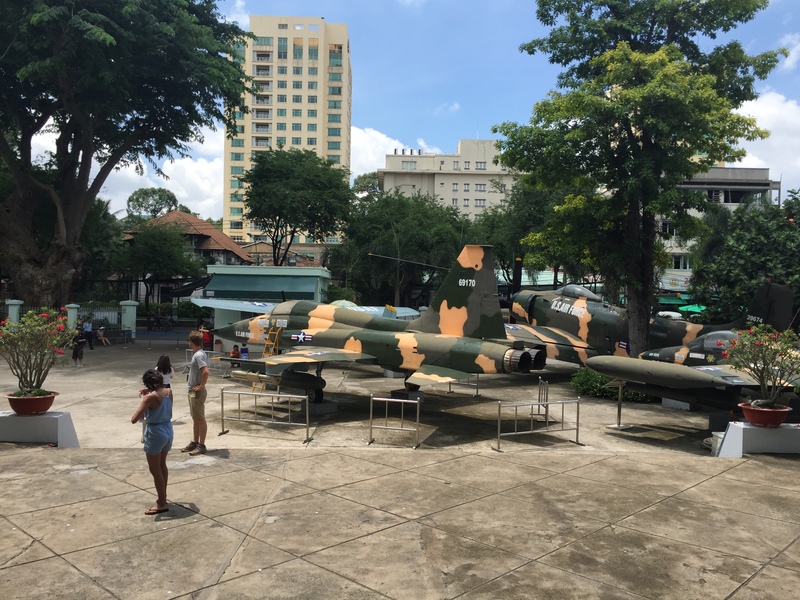 I got a chance to visit Saigon, Vietnam last month. In my 6 days of trip, i visited two must visit place in vietnam, moreover if you are historian type of person. This two places are really really interesting. It evokes the curiousity inside of me when i visited these two places. 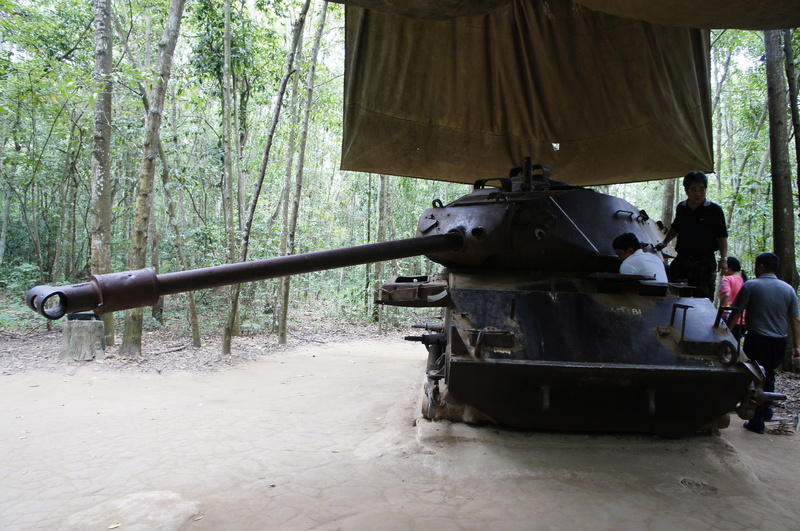 Firstly is The War Remnant Museum and the second place is the infamous Cu Chi Tunnel. When many of travellers must put museum on their to go list. Im quite the opposite kind of travellers. Im more to cafe hopping or sightseeing. Well, i do like museums too, but its not priorities. 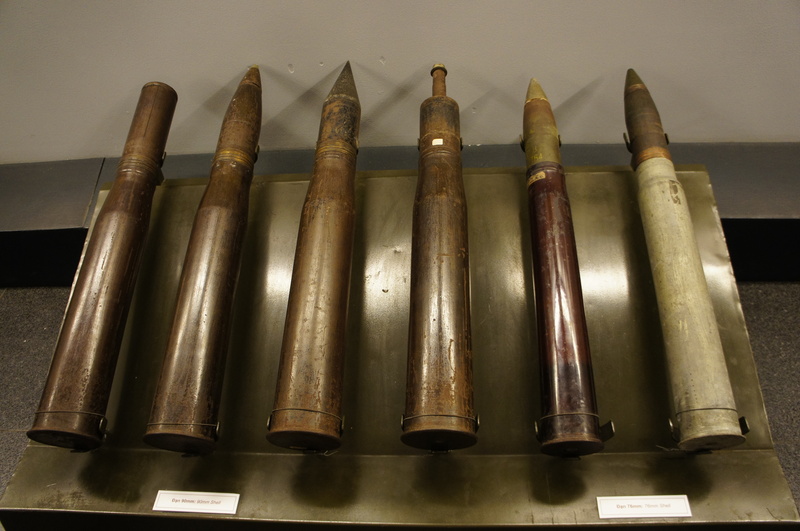 When i stepped in to this museum, i kinda felt sleepy, its an old three storeys building, with some war leftovers like big tankers, bazookas, and many other weapons. There was a group called National Liberation Front or well known as Viet Cong, a group of people who want to fought for freedom from USA. America was so cruel that time, they killed everyone who’s getting their way,they think everyone can become a thread, that everyone is Viet Cong. There is one village named My Lai inside Quang Ngai province, which Suspected to be the homebase of Viet Cong. 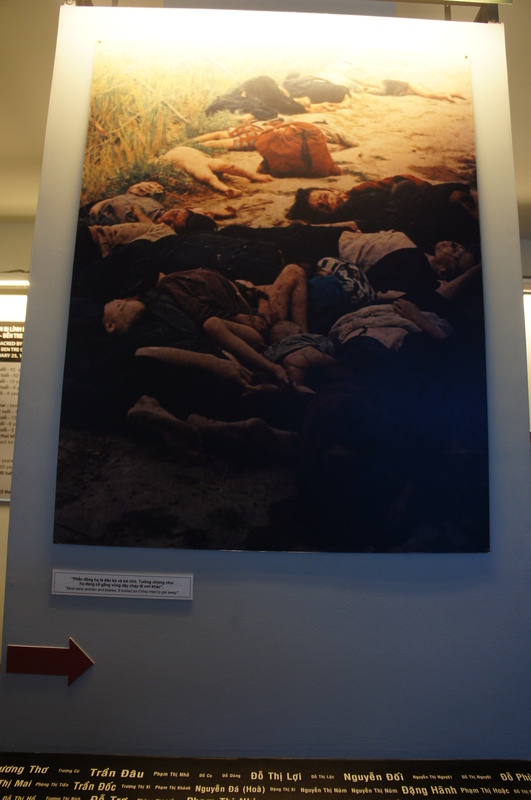 And the US troops just killed every vietnamese there, including women and children. 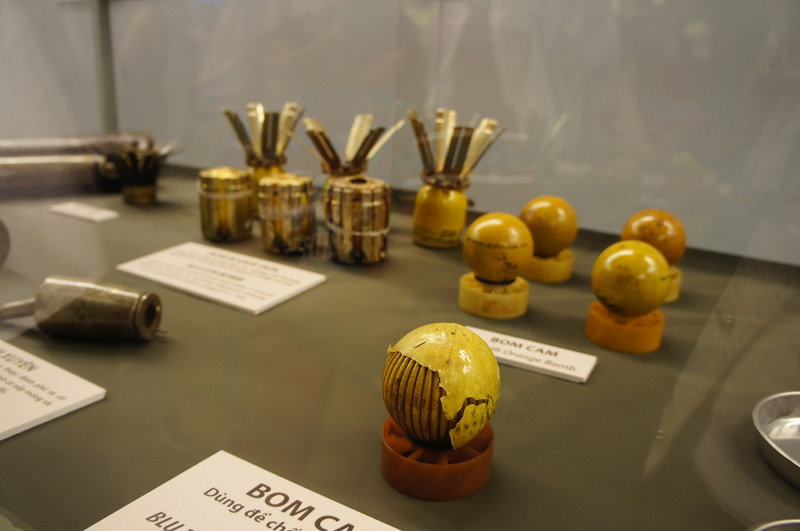 Another ruthless acts was they bomb south vietnam with an ‘Napalm – agent orange’. A very concentrated herbisides, like a jelly substance that practically will stick to anything and burn it right away. Napalm is one of the deathly substance that has ever been made. I guess thats the second biggest drop after Nagasaki and Hiroshima done by the USA. Thousands of vietnamese died right away after strucked by the agent orange. And thousands of other vietnamese who did not died, they must suffer terrible effects, such as burnt skin, lost thier limbs, and disabled for life because of the napalm residue. This effect dont just stop there, it passed through their generations, hence all the babies are born incomplete, either they are blind, no limbs, unproportional limbs, cant walk properly, etc. A really an unending nightmare. 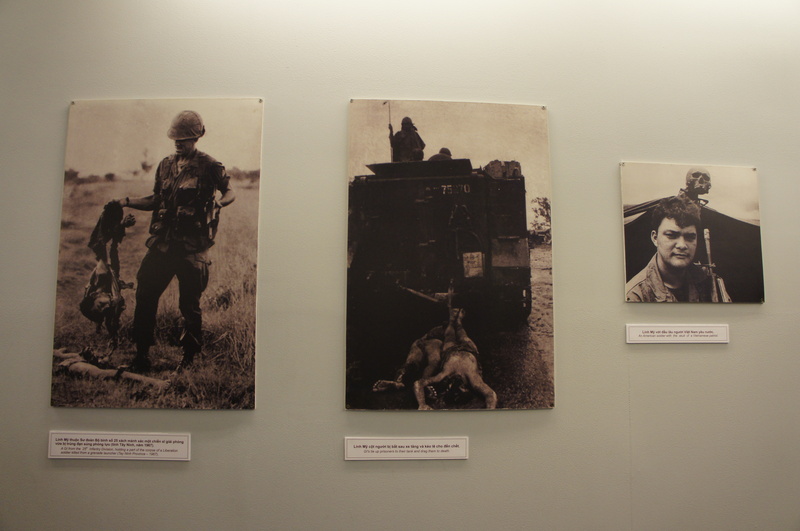 This museum showcased all the war pictures taken by international journalist from all over the world. since the beginning of war till its ends. America finally ‘knocked down’ by the Viet Cong after years of war. They decided to go home because they have lost more than 58,000 soldiers and lost a lot of money only for this Vietnam war. History writes that this war was bigger than the World War II. Vietnamese use ‘Guerrilla Warfare’, which some says they learnt it from our general, AH Nasution. The most amazing this is, the Vietnamese fight with traditional weapons, like sharp bamboos while the US troops were all well-equiped. Other countries tried to send modern weapons as well for the Viet Cong, but how did they send the weapons while US troops watching the Whole country day and night? 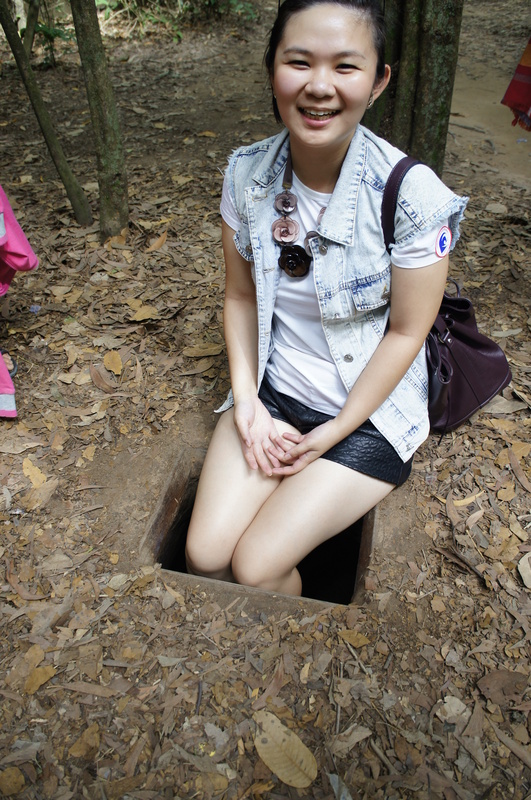 That’s where Cu Chi Tunnel play a big part, which i will tell you later. 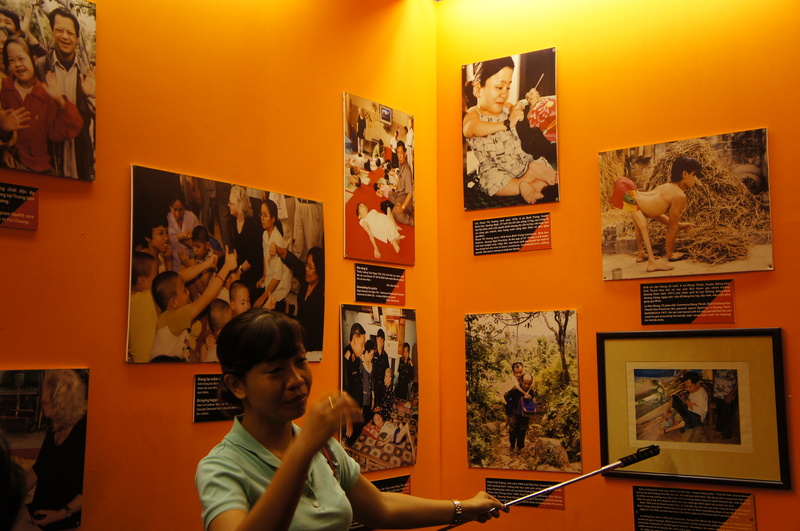 This museum also showcase the disable people who suffered from the residue of Agent Orange. 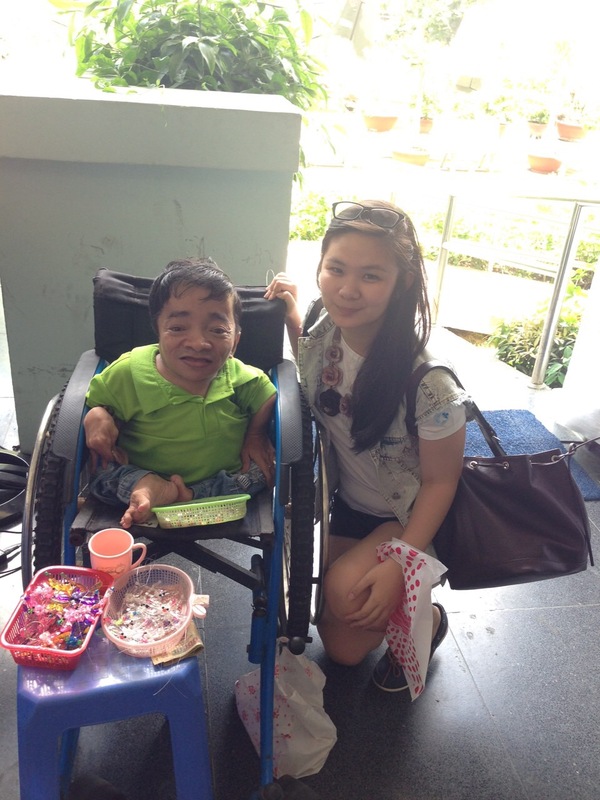 i was so saddened when i saw them. and not only me, i saw some other visitors shed some tears when they watch the blind man played the keyboard, while some men who have no limbs tried to sell some handmade keychains with his one little small hands. indeed a heart-breaking moment for me. one thing that we should learn from them, keep the hope high, because that’s the only thing that makes us living. This place is located quite far from Saigon city, i must travel by bus about 2 hours time. I was wondering why this tunnel located so far away from the city. Was the forest have more space to build an underground hiding place? or that particular place have plenty of foods when they need to hide for years? I was shocked to know that this tunnel was made over there, because it’s near to Cambodia’s borderline. 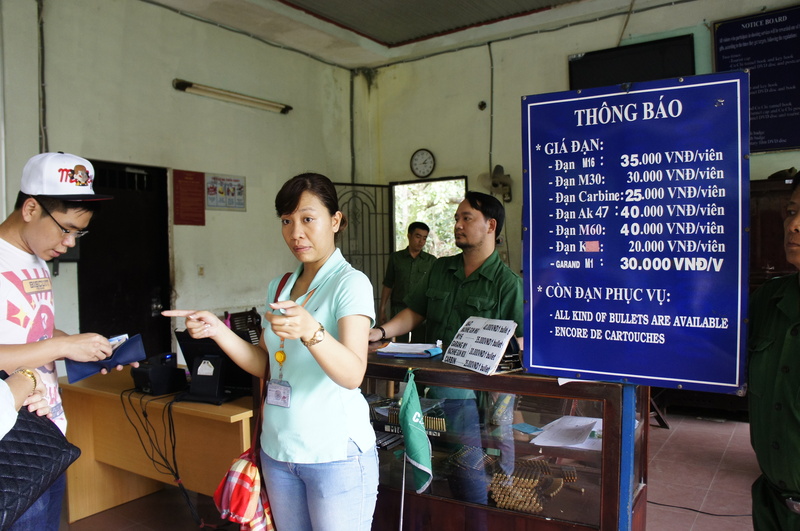 They use this access to sent all the weapons from the North Vietnam to Laos then to Cambodia then to South Vietnam. During that time, the soldiers can only walk from North Vietnam to avoid the US troops. So they need about 6 months to pass by 2 countries, just to deliver the weapons to Viet Cong. Really an act that we must respect! 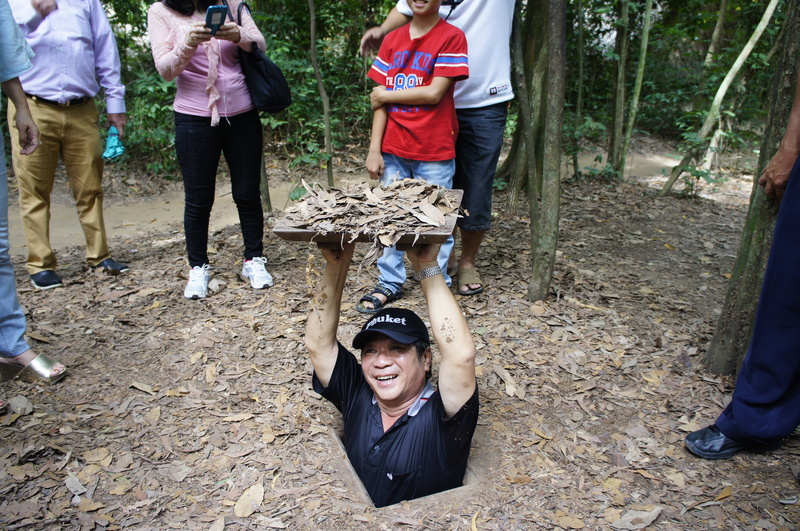 Another jaw-dropping thing is how the Vietnamese made the underground ‘village’ where they stay for years. when i say a ‘village’, it is a real thing, where they have meeting rooms, kitchens to cook, temporary toilets, a place to make weapons,even a theatre for them to sing and dance. They built the 3 storeys underground with a very small entrance and many traps inside. Hence, if the US troops found them, they will be killed by the traps, and if they bombed the first layer, they stil have the second and third layer to hide. Secondly is how they get the air and water. The tunnel is near a river, they can managed to pump the water into the tunnels. as for the air, they need to camouflage the bamboo sticks up there that looks like an ant-nests, to get the air from above. Thirdly is how they cook. There’s always smokes normally when we normally cook, so to camouflage the smokes, They need to cook very early in the morning, because it will be seen as morning dews when it already reached the top. The last thing is their last resources if US troops found their hiding place. They already made a way out to the river, and alreadt prepared many small boats for them to escape. The tunnel is indeed very small. less than 1m x 1m. My tour guide said that the management already made the tunnel a little bit bigger for tourist purpose now, the initial tunnel was just half of that size, and below is the real entrance to the tunnel. I wanted to try the real entrance, but im afraid i cant pull myself out, hahaha. I only tried to went in to the tunnel, a short 20metres long for the tourist to try. even 20 metres long seems very far for me, it is very dark down there, very stuffy, and very small. you have to kinda squat all the way to get yourself out from there. cant imagine they need to do this everyday for almost 25 years. This forest is very big, and they have some workshops for you to see as well. 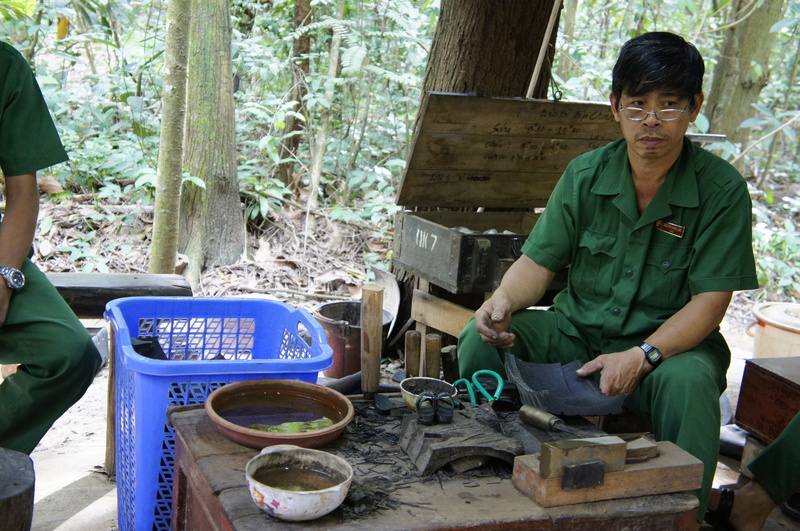 Like how the Viet Cong cooks that time, and how they make their own slippers from the tanker wheels. They said it’s proven the best slippers in the world, because you dont need any glue to made one, and it’s very safe to use, it’s thickness will safe you from stepping on sharp things, and will stay for as long as you can remember. They have shooting range too, where you can try some guns like M16, M60, AK47, and other models for about 20 dollars for 10 times shoots. 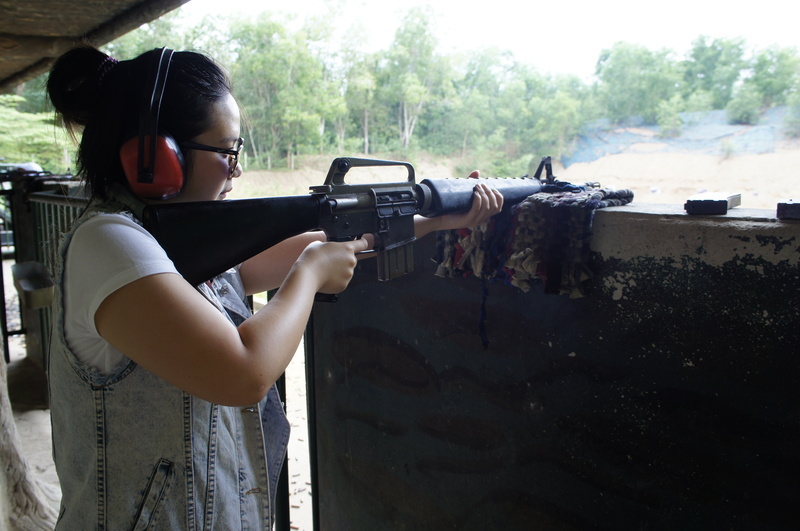 My experience in firing real guns was very scary but exciting at the same time. i was really shocked to hear a very loud voice of the gun-fire, and to feel the recoil for the first time. i tried M16 that time, expert said to use M16 for beginners because the recoil is not to strong. they said someone injured her shoulder when trying AK47 because of the strong recoil. it was very scary for me, i cant imagine how they use those weapon to kill a person, even to hit a dummy target is so frustrating to me. indeed there 2 places are the must visit when you are in Vietnam. all i can say is they are freaking smart, and a country that worth our respect, because they can get up from their miseries and become a developing country like today. 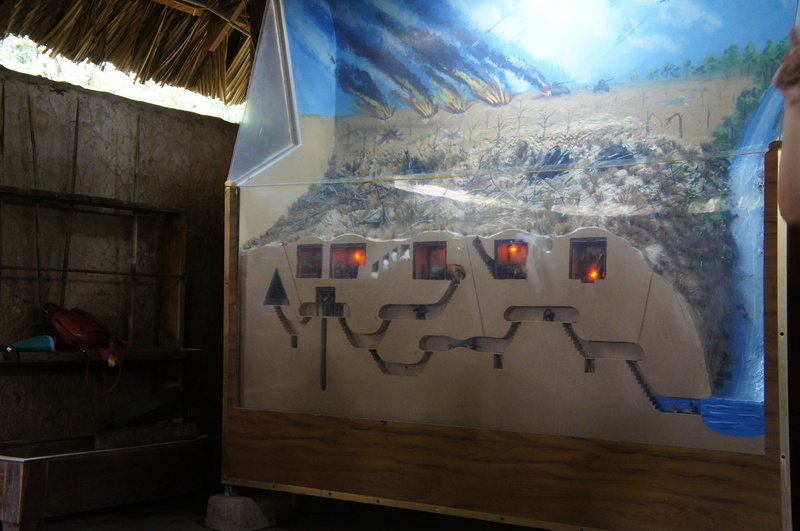 This entry was posted in Asia, Museum, travel, Vietnam and tagged agent orange, cu chi tunnel, ho chi minh, jendstravel, m16, museum, napalm, saigon, shooting range, vietnam, vietnam war, war remnant museum. Bookmark the permalink. Aaaaa keren bgt, Ci! Noted must-visit kalo kesana! Keren! Belum pernah ke Vietnam, will definitely visit it one day. Kayaknya emang klo ke Vietnam ga boleh lewatin tempat ini ya Jen. Secara Vietnam lekat dgn cerita2 perangnya.